One of the problems of cutting wood in a natural area is keeping the ecosystem from getting disrupted. Clearing the East Basin resulted in lots of wood, mostly of firewood quality. Fortunately, in our area there are lots of folks whose main heat source is wood, and they are delighted to get free wood. We, on the other hand, are delighted to get free trucking, since moving heavy wood is expensive. In order to avoid too much disruption of the soil, we like to have this work done when the ground is frozen. On the other hand, if there is too much snow, our woods road is often impassable, so there is a narrow time slot when this work can be done. Now is the time. 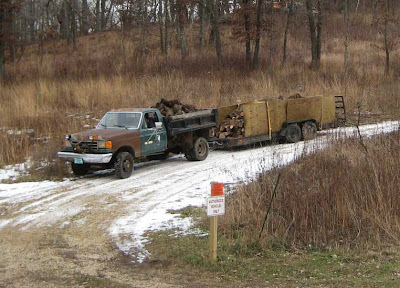 The people taking out the wood use a Bobcat together with a heavy truck and trailer. The Bobcat, which is basically a small front-end loader, is quite mobile and does not mess things up too much. We're happy to be able to recycle this wood and especially to get it out cost-free. In my last post I discussed our current work eradicating sumac clones. These clones were all located while they still had brilliant red leaves, and were mapped with our Garmin GPS. The data were then converted to Excel and transferred to ArcMap where they were plotted. Each red dot on the map is a sumac clone. I removed most of the other features so that the sumac clones would stand out. We actually have 100 clones, but only 90 are mapped. There are lots of sumacs on the south-facing slope as well as in the savannas. However, the absence of sumacs on the east side of the Conservancy may be an artifact, because we concentrated our mapping on the south and southwest sides, because that was where experience had shown us they were most concentrated. This map provides some real visual evidence that there are lots of sumacs, and makes us feel that we are doing the right thing by getting rid of them. There is quite a learning curve with ArcGIS, but I am finally beginning to think that the time spent is worth it. Sumac is one of those native species that can become a major problem in prairie and savanna restoration. Some folks simply let it exist, which is a mistake. It is fiercely clonal and has the potential to dominate a site, given time. Annual burns will set it back but do not eliminate it. Stop and look at some of the sumac clones along the highways of southern Wisconsin. Because of the heavy shade they create, the ground underneath is essentially sterile. At the last North American Prairie Conference in Winona there was a paper on eradicating sumac in a Nebraska prairie. According to the author, over the years that prairie had become about 50% sumac! For some years, we tried to get rid of sumac by simple mowing, generally in mid summer. This sets it back, but does not get rid of it. A large clone that Kathie mowed at Black Earth Rettenmund Prairie was greatly set back for a year or two but has now returned, just as bad as ever. Obviously, there are living rhizomes underground that eventually grow and recolonize the site. One of the problems with sumac is that it has such stunning fall color! This year was especially good, and many people remarked at how beautiful it was. This was true, but from my perspective, the fall color was an opportunity for us to set up a sumac database so that we could eradicate it in the winter. Every sumac clone was located with GPS, and was given an ID #. Single plants were ignored and only the clones were marked. We ended up with over 100 clones, which seems like quite a few to me! How to eradicate? The researcher at the Prairie Conference used foliar triclopyr, applying it by a sponge device from the back of a tractor. However, our topography does not permit use of a tractor. After returning from the Prairie Conference, I set up some experiments using triclopyr as a basal bark (Garlon 4 in oil). At that time, all of the sumac clones still had leaves, so it was easy to monitor the results. I did about 25 small clones, spraying about a 10 inch band at the base of each living stem. Within a week the leaves were looking wilted and within two weeks the leaves were all brown. If was after this success that we set up our sumac database. We started our basal bark work on the clones a few days ago. All the leaves are gone from the clones, making them easy to get into. According to the Dow Agrosciences recommendations, if the stems are less than one inch in diameter you only have to spray one side. It is going to take quite a bit of herbicide, but the expensive part is not the herbicide but the wages of workers. Hopefully, we will only have to do this work once every ten years. We are keeping track of which clones have been sprayed, so that it will be possible for us to know we have done them all. Also, we can return next year and look for any problem areas. Winter is a good time to do basal bark treatment. Even if the temperature is below freezing, the herbicide in oil remains liquid. However, we do need snow-free ground. Hopefully, this year won't be as snowy as last winter! Mullein (Verbascum thapsis), also called flannel plant, is a large sprawling weed that loves to colonize bare ground. It is a biennial which in its second years sends up a very tall flowering stalk that makes lots of seeds. To control these second year plants, one has to pull or dig them, being certain to get the roots. Because of their large size, they are a pain to pull. In the East Basin we have a very large amount of mullein, all first year plants. They colonized all the bare ground we created when we removed all the trees in this habitat. Instead of pulling, we are spraying with Garlon 4 herbicide, dissolved in an oil carrier. This is equivalent to basal bark treatment and is very effective. The procedure is to just spray the center of the rosette, above the root collar, and the herbicide finds its way to the root and kills it. Since we have 100's of plants, this is the only way to go. Our three-person crew worked systematically across this 4.5 acre unit, seeking out the mullein plants. Heisley's photo show the procedure, and the green plant just under Marci's sprayer is a mullein. This photo also shows what this unit looks like at present. Earlier this year we thought we were going to plant this whole unit to prairie about now, but when we found how rough it was we decided to wait a year. We are now working hard to get rid of all the bad plants, with the idea that in the long run this will be preferable to trying to get rid of them later. Also, there are aspens here, which have been girdled but are not yet dead (see the background of this photo). This will give us another year for them to die and then we can get rid of them also. The nice thing about spraying mullein now, when most everything else has died back, is that it is easy to spot. 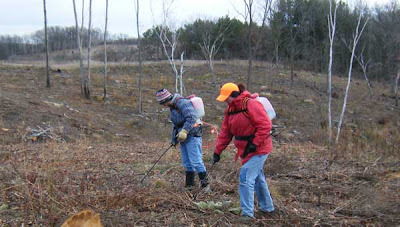 In addition to mullein, the crew has also been spraying any remaining live honeysuckles and buckthorn, as well as anything else bad. Better to spray now, when there is nothing good, than to wait until later, when our prairie has started to grow. We are getting near the end of our seed collecting. Today, Kathie collected heath aster (Aster ericoides) and I collected Tinker's weed (Triosteum perfoliatum). Heath aster is interesting because it is one of the first plants to appear in the spring, yet it doesn't flower and set seed until late fall. This is a species that forms clones or fairly large patches, and in the spring the leaves are soft and green. As the season wears on, the plants get progressively rougher, until by the time they are flowering in mid October, they are beginning to feel like a Brillo pad. (I suppose that is why it is called "heath" aster, since plants of the heath family have a similar appearance). Heath aster is a dry prairie species, and at Pleasant Valley Conservancy we found lots of it on our very dry and severe south-facing slope. This year, the plants there flowered poorly and seed set was really bad. After an hour, Kathie gave up and went to the Cabin Prairie, a mesic prairie where most species grow better. She found several good patches of heath aster and was able to get some nice seeds. When looking on web sites, I discovered that there are quite a few cultivars of heath aster that are sold to gardeners. I assume gardeners like it because it flowers late, and the large clumps and patches are quite showy. I collected Tinker's weed fruits in two of our savanna areas. This plant, sometimes called feverwort, late horse gentian, or wild coffee, is a characteristic savanna species, at least at Pleasant Valley. We don't find it in any prairies, and in our oak woodlands it is very scattered, but there is a lot of it in the savannas. Although the flowers are not very showy, just tiny reddish ones in the axils of the leaves, the leaves are quite distinctive. There is almost always someone on any of our trips who asks what it is. As the photo shows, it forms fruits that look like tiny tomatoes. Not surprisingly, the homeopaths have found some uses for these fruits, but I suspect like most of these so-called remedies, it is worthless. When you collect Tinker's weed fruits you are actually cleaning them at the same time. The trick is to cut the stems with all the fruits intact, carefully turn upside down in a bucket, and then quickly strip off the seeds. They are dislodged easily and fall the bottom of the bucket. In a half hour I easily collected a pound of fruits. According to Cochrane and Iltis, Tinker's weed likes "heavy" soils and is absent completely from the Central Sands. It also grows poorly or not at all on soils derived from St. Peter's Sandstone. Perhaps this species is a calciphile. Today we also picked up our tractor from where it had been serviced in Sauk City. We ate lunch in Prairie du Sac and stopped at the bald eagle viewing site along the Wisconsin River. Not an eagle to be seen. Then on the way back we crossed Black Earth Creek on a small town road bridge and there, as plain as day, and almost next to us, was a spectacular bald eagle. As long as we stayed in the car, he was happy, but as soon as Kathie got out to take a picture, he flew off, soaring low over a plowed field and settling down again along the creek farther upstream. Nice! I am slowly learning the capabilities of ArcGIS, the widely used mapping software that has elements of database and graphics arts. I have been able to bring in two air photos of Pleasant Valley Conservancy, one from 1937 (grayscale) and the other from 2007 (color). There are some important contrasts, but overall the two photos look surprisingly similar. 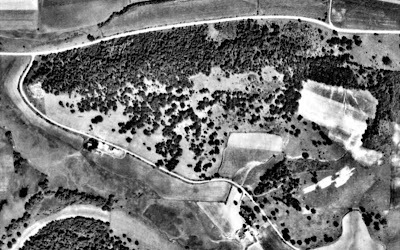 Mainly, this similarity reflects all the restoration work we have done over the past 10 years, because if I showed a 1997 air photo it would look completely different. Of course I cheated a little, since I carefully cropped them in Photoshop so that their boundaries were identical. In ArcGIS I can layer one of these photos on top of the other, change the transparency of the one on top so that the bottom one shows through, and overlay with symbols representing trees from of our tree database. I can also measure areas and distances. 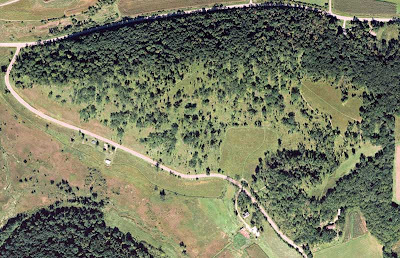 For instance, the cropped area that is now Toby's Prairie (the open field at the top right) was 7.6 acres in 1937, and is 3.6 acres in 2007 . What happened to the rest? Actually it is now part of the savanna to the south, across the service road that can be seen (faintly at this scale) on the color photo. I believe that once they started farming with tractors instead of horses, they were unable to crop down the hill as far, in fear of getting stuck. Another thing I have been able to do with ArcGIS is bring in a bedrock map of Dane County (kindly sent to me as an ArcGIS shape file by the Wisconsin Geological and Natural History Survey). This has made it possible for me to map exactly where the dolomitic rocks are found, which is helping me understand the distribution of buckthorn (since buckthorn is a calciphile found almost exclusively at Pleasant Valley on the dolomitic soils). Since I have a whole set of air photos of our property, I should be able to create an interesting time series, providing lots of quantitative data that was not previously available. More to come! In my post on the North Woods burn, I mentioned that oak leaves were ideal because they carry a fire well. 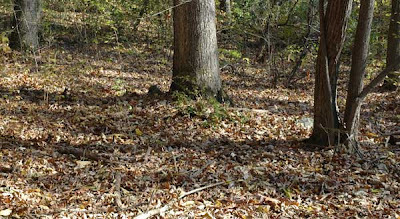 The photo here shows a typical forest floor in an area of white oaks. The carpet of oak leaves is typical in areas that have not been burned. This is not from Pleasant Valley Conservancy, but in an old-growth forest that has probably not been burned for over 100 years. Under these conditions, decomposition more or less matches leaf fall, resulting in a fairly constant and substantial leaf pack. You can see how the oak leaves are curled up, which is partly why they carry a fire so well. It is my opinion that most oak woodlands in southern Wisconsin should be burned frequently, no less often than once every three years. Burning top-kills invasive shrubs as well as small tree sprouts, keeping the understory open. Because of the shade, there is no summer or fall herbaceous flora. The only forbs are those that grow in early spring, before the leaves are out. Once leaf out has occurred, it is too shady for forbs, except in small open areas resulting from windthrow or disease. 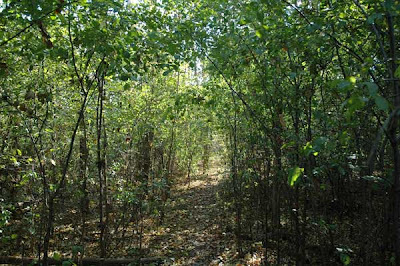 On the other hand, if there are invasive shrubs on the ground, such as honeysuckle or buckthorn, the woods should not be burned until these woody plants have been dealt with first (probably by basal bark treatment with triclopyr or equivalent). Note that this post is about burning oak woodlands. In my opinion, oak savannas should be burned annually, because the higher light regime greatly increases the chance for development of invasive shrubs. Let me emphasize that the images here are "not" from Pleasant Valley Conservancy. They are from an area that was cleared of all buckthorn about 10 years ago and then ignored. What is shown here is regeneration from the seed bank. All of the "old growth" buckthorn had been removed. There are no plants here with berries (buckthorns don't start flowering until they are older). This is an example of what happens if you don't follow up on a buckthorn clearing project. There are some rather dismal reasons why there was no follow up here. The point is that one's work isn't done when one rids an area of buckthorn. You won't find discussion of this situation in any of the numerous manuals or web sites that deal with buckthorn. Why? How about burning? Despite strong hope from the folks who did this work, there was no burning done, again, for rather poor reasons. Burning would have certainly helped a lot here. There are plenty of oak leaves to carry a fire. Annual burns would have kept the regeneration in check, although it would have not eliminated growth from the seed bank. Instead of having the fifteen foot high buckthorns seen here, there would have been plants a few feet high, and much more amenable to attack. Moral: don't spend volunteer time or donated money on a major restoration project unless the work can be followed up. 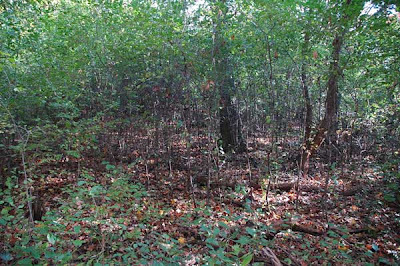 Just to be clear: 99% of what is green in these photos is a buckthorn plant! I am in the process of learning ArcGIS 9.3, the fairly complex software by ESRI that is going to be one of my major tools for long-term management of our oak savanna restoration. I had hoped to post my latest results on this blog, but I was unable to get Blogger to display the air photo/map I created at a large enough size. Instead, I have posted this directly on the Pleasant Valley Conservancy web site. Use this link to reach that page. I returned today and did a detailed assessment of the quality of the North Woods burn that we had done on Thursday (see last post). I used my Garmin GPS in Track mode to circumscribe the area we burned. I started at the top of the ridge, next to the North Fire Break. I followed the edge of the burn down hill all the way to County F, then continued east, following the direction that the drip torches had taken. Except that not everything the drip torches touched carried fire, so there were significant jumps. So I spent about two hours climbing up and down hill, following the burn line, and all the while moving east toward the edge of the unit. I ended up almost to the top of the ridge once, and then plunged back down toward the bottom. This jagged fire line was made because there were areas in the woods that were almost devoid of trees, so there was no oak leaf fuel. I did see lots of areas where brambles and honeysuckles were top killed by the fire, which is one of the goals of this sort of burn. I finally got to the end of the burn unit at the top of the ridge (just west of Toby's Prairie) and then walked back along the North Fire Break to my point of beginning. The walk along this fire break was interesting, because up at the top of the ridge there were lots of brambles and buckthorn that were top killed. Next spring we will be revisiting these areas and herbiciding the new sprouts that will be coming from the dead stems. This will be easy work because the burn really cleared out the area, so we will have good access for spraying. At the end the GPS told me that I had circumscribed 15.3 acres. These were the areas that had burned essentially completely. 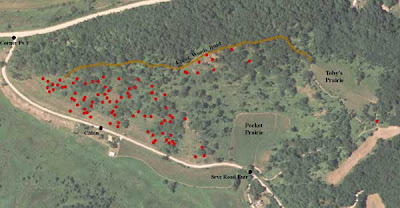 Since the whole burn area was about 25 acres, the average coverage was 61%. This would not be good for a prairie burn but is great for a woods burn. The irregularities of the terrain and the heterogeneity of the vegetation are responsible for these differences. In addition to assessing the quality of the burn, I also got to see a few really nice wooded areas that I was unaware of. There was one rather open area with a lot of medium-sized white oaks that I had never noticed. Usually when walking in this woods I keep to the trail, since clambering over blowdowns and dead trunks is a little tiring. Eventually I will get the GPS track data into ArcGIS so that I can relate the burn better to the surrounding vegetation, using the tree database we have created. One thing always leads to another, which is what makes this sort of work so interesting!